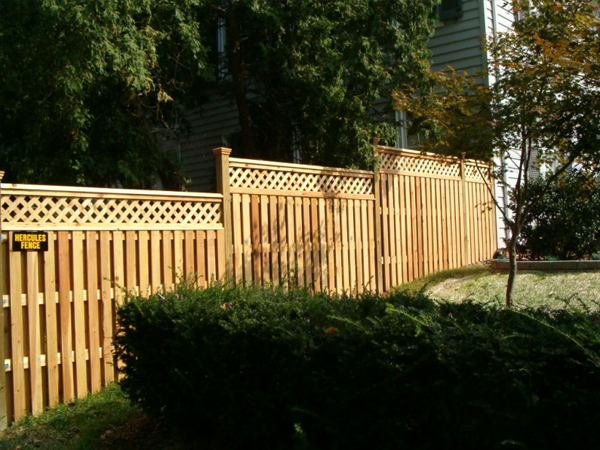 While the stereotype may be that wood fences are more subject to degrading over time compared to other fences, the fact is that not only are wood fences treated to stand up to the elements, but with a little work you can easily maintain a fence and keep it looking good. Wood fences are typically made of cedar or redwood, which are more resistant to decay than other species of wood. Pressure-treatment and chemical treatment of woods post makes the part of the post which is below ground less susceptible to insects and moisture. As for fence care, there are a few simple steps you can take toward increasing the lifespan of your fence. Staining the fence is a great way to protect the wood, and it looks like as well. Eco friendly stainers like castor oil and linseed oil provide protection for the fence with using volatile organic compounds. Preventing the growth of vegetation around a fence will also increase its longevity. Take care not to let dead leaves and other debris pile up around the fence. These can hold water at the base of the fence which will cause it to rot. If you water your lawn with sprinklers, make sure they don’t spray the fence or leave pools of water at its base. Cleaning the fence with a broom will remove dirt and cobwebs that may have collected on it. If the fence needs to be repaired, repair it as soon as possible before the damaged part of the fence starts to compromise the integrity of the rest of the fence. Follow these simple steps and you can enjoy your wood fence for many years to come. Hercules Fence of Richmond, VA prides itself in installing fence at some of the most prestigious places in the world, as well as for many government agencies & and well known businesses. We are proud of our unique and prestigious fence installations that we like to recognize as our ”Signature“ projects. Whether a custom installation designed by a Hercules professional, or a challenging project at a national landmark, Hercules fence takes a special pride in these jobs. In addition to offering you experience and stability, Hercules Fence can offer the buying power of the largest fence company based in Virginia. Whether you are seeking chain-link fence, wood, PVC, ornamental aluminum, ornamental steel, decks, gate and operator systems, guardrail, dog kennels, wire mesh cages or construction panels, Hercules can buy the product at a price that will afford you value to complement our quality. If you choose Hercules Fence of Richmond, VA today, you’ll learn why we’re the best in the business. The knowledgeable people of Hercules Fence have developed a reputation since 1955 for professional service and quality installation. With over 50 years in the fence business, we are well aware that our reputation must be earned anew every day. Contact Hercules Fence of Richmond, VA today at (804)752-7992 or contact us on our website to talk about a residential or commercial fence. This entry was posted on Thursday, September 12th, 2013 at 9:29 pm. Both comments and pings are currently closed. © 2019 Hercules Fence Richmond, VA. All rights reserved.